What is the point of trying to recycle in Oxford? The council don't care. What they have cleverly done is set-up a "pretend" recycling scheme, whereby they hand out recycling boxes and leaflets and then never, ever bother come to collect the recycling. Genius! Our recycling hasn't been collected since way back in January. When I complained at first I was told it was because there was a new recycling scheme and I needed a blue box. Well why not tell me that instead of just leaving the recycling you dumbasses? So I get a blue box and put all the tin cans into. Ooh - now we can even recycle plastic stuff (PET1 and PET2). We got our blue box around the 26th of January - and it has not been collected since. The green box with glass and paper still gets collected. I've made three phone calls to Oxford Council about it. Each time they tell me they will look into it as a priority and get back to me. LIARS! They've never got back to me and my recycling box is still full. I'm perfectly prepared to accept that I could have done something wrong. Perhaps I've committed some heinous recycling crime, like left a label on a tin can or something. It's a new system - if people do things wrong they need to be told. Not just ignored. 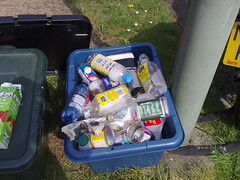 Well, I can only presume that this is all part of Oxford "bloody useless" Council's clever pretend recycling scheme. We'll stop trying to recycle now. We'll just chuck everything in the main bin. Serves us right for bothering to try.